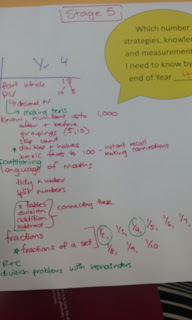 This afternoon we had a staff meeting with Sue, our maths PD lady. 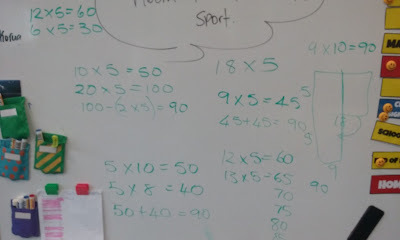 We started off with a warm up problem, just like we would in a class with our students. 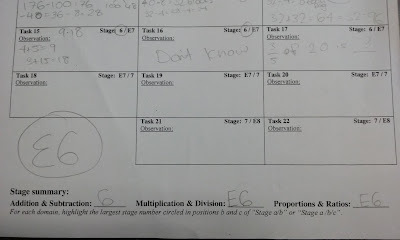 She asked us 18x5= and to work it out in our heads, and it was much harder than I expected! 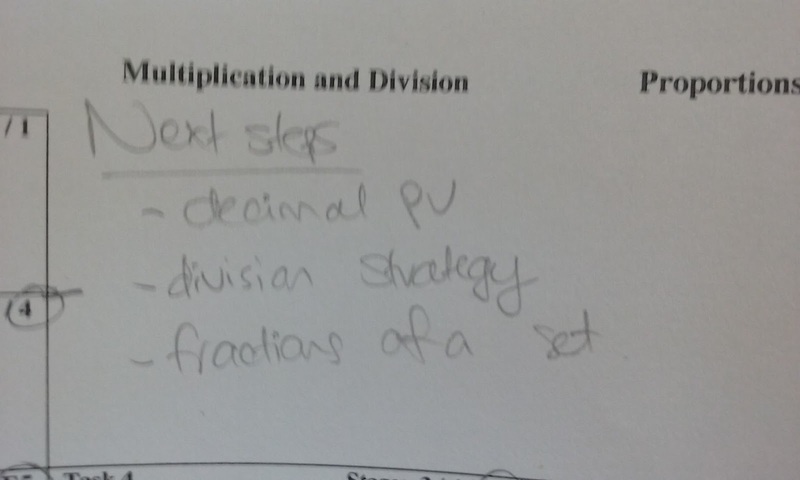 I instantly reached for a pen and paper, to write out the algorithm.. but alas, this was not allowed. It took me a second to think about how to do it without a pen in my hand, as I always had done. 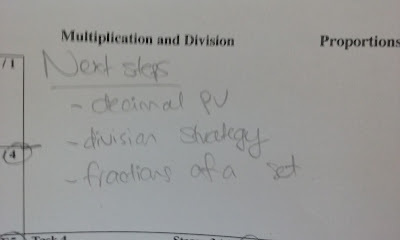 I naturally leant towards rounding and compensating, and partitioning strategies. We then started discussing our different year levels and their associated achievement levels. 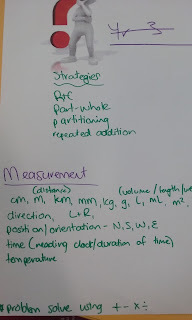 Archana, Luti and myself worked together on Stage 5 Maths and made a list of everything that the students need to know by the end of year 4. It was an awesome way to recap what it expected at Stage 5, how this links in with GLOSS assessments, OTJ's, and what we are teaching everyday. After we had regrouped and shared each stages expectations, we looked at our own planning from this week and analysed it. The main question we had to ask ourself was 'is this lesson aimed at the right learning level?' (Read: Is this a year 4 lesson for my year 4's, or a year 2 lesson for my year 4's?). Archana and I found that we were using the right strategies for our age level, but the numbers in our problems were too easy. So the next steps for us is to look at our problems and keep them at the level they need to be at. Something else surprising for me was when Sue reminded us that everything we do, should be encouraging a growth intelligence mindset. She said it, as I wrote a note to myself to bring my basic facts cards for my students to practice their instant recall... 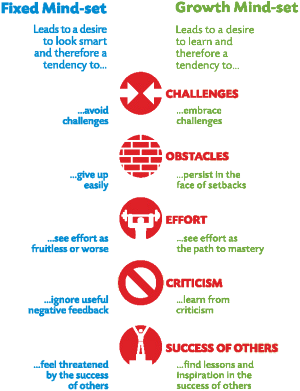 Which is the exact opposite of a growth mindset. Making basic facts instant recall a competitive game put students in a fixed minds-set, because if they don't know the answer they are losers, they are losers in their team and they miss their chance to offer an answer. That is the opposite of the learning culture we are trying to achieve in our classes. I was really caught off guard when she said this, and it very quickly reminded me that I need to always think of the bigger picture of what I am saying and doing with my students. 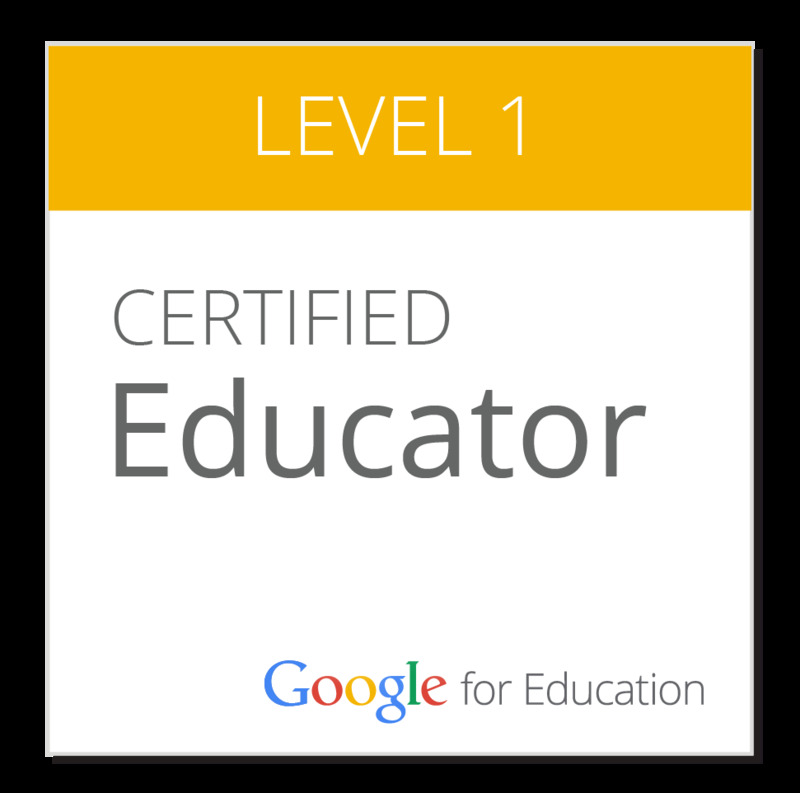 Today is the day 3 of Digital Immersion and we are sitting the Google Exam (Level 1). It is a end product for the Fundamentals course we did throughout summer and over the past few weeks. The exam consists of 20 multi-choice/drag and drop type questions, then 11 scenarios. In each scenario, there are multiple tasks you have to complete. 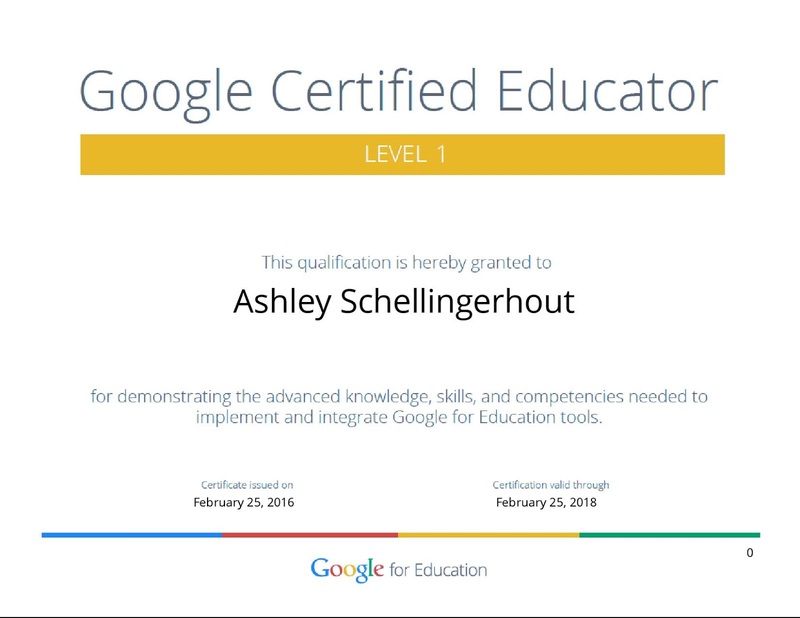 These scenarios take you through all different aspects of the Google for Education tools, including forms, sheets, calendar, docs, emails, classroom, etc. Even though I completed the Fundamentals course, I still learnt things for the first time as the exam walks you through step by step what it wants you to demonstrate. 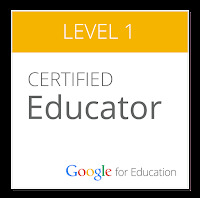 Here is my certificate and the badge I can now add to my blog, emails etc. I can't image how much effort it would have been for a mentor teacher to give feedback on a regular basis on so many different aspects of their BT's teaching life. In the digital age, as lucky as we are to be in, it is sooooo easy! Today I completed the planning for next week on my own, rather than doing it with my mentor. 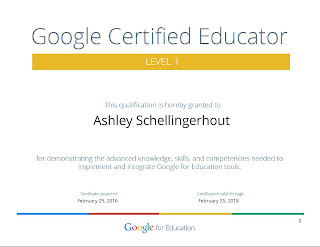 It was a bit daunting, as I had to find/make and use templates appropriate for the purpose, find resources, link into so many different places and then link all that into the google site for the students to see, but I did it! (and now that the setting up part is done, next week will be easier!). Archana was busy at the time, but has already given me feedback on it. 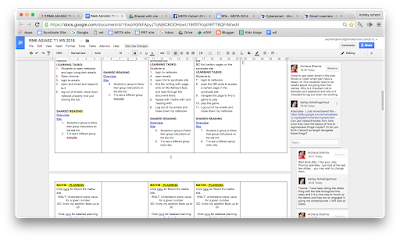 A simple comment on the side of our weekly plan gives me immediate feedback and feed forward. It is quick for my mentor, quick for me to read and quick for me to respond to... and it can't be lost like a feedback piece of paper! From uni classroom to my classroom! During my third year of my BEd, I took a drama elective in summer school. It was taught by Dr Elizabeth Anderson, quite a reputable name in the performing arts in education world. I loved that paper, and loved drama even more because of it! Today we started our syndicate arts rotation, and I am taking drama! Eeeep! So excited to implement some of the most fun active learning I did at uni. I used some of the activities we did with Elizabeth, and the kids loved it! 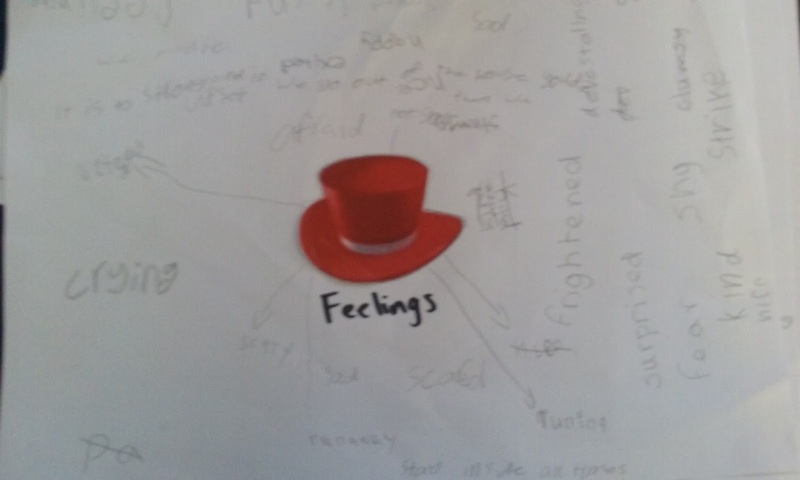 Yesterday I took a lesson, trying to introduce the thinking hats in a real way. 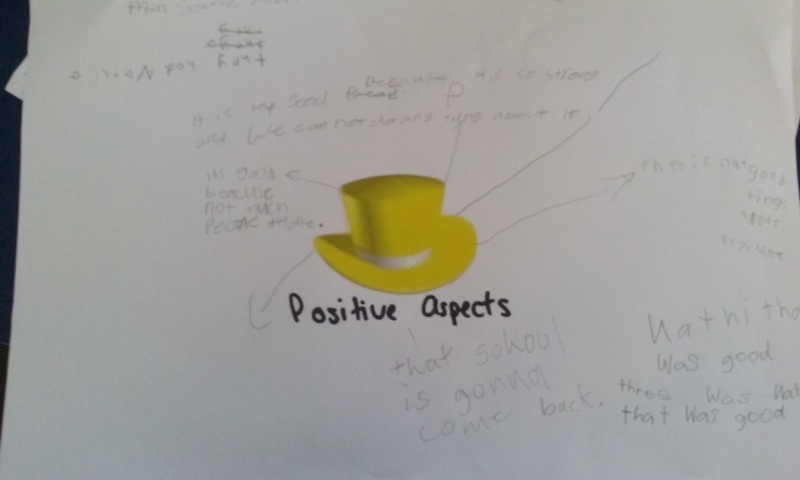 We used this article as our base, and then explored the different hats about this topic. 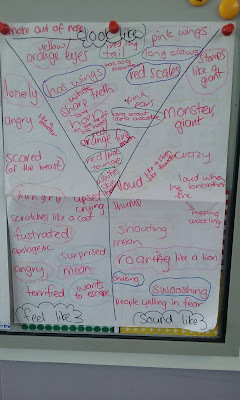 I used a bus stop activity (students have done this before) and was surprised when they became loud, disruptive, kept fighting with each other and being silly. We came back together in a circle and tried to go through what people had written for each hat, but it didn't end well. They had just finished a great lesson beforehand, the best lesson I had ever had with them. And now...? At the time, to be honest, I blamed them. I took away from their learning and lectured them about respect and what to do if someone annoys you instead of looking deeper and addressing the real problem. Was this activity suited to them? Was it a bit too hard? Did I introduce it and explain it enough? In hindsight, it was probably hard for some of the students. I definitely could have explained the activity more. We definitely needed to break down the article more and discuss its contents more. 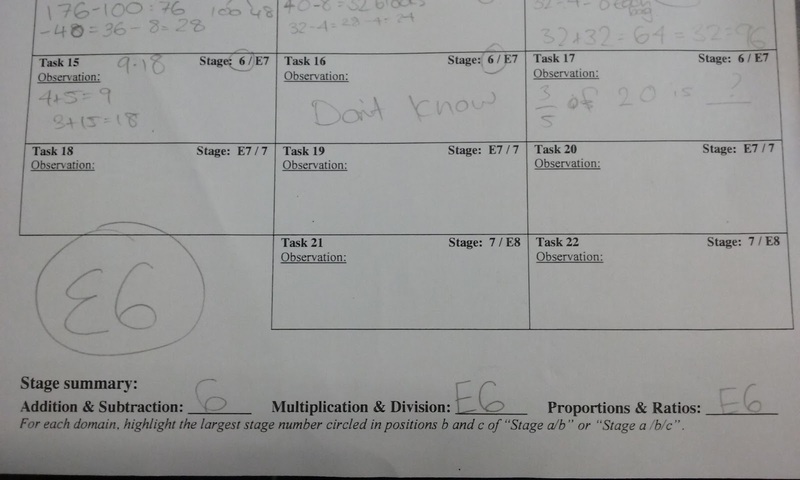 I don't want to belittle the students work documented here, but I know they could have done better. This is not a pity party, woe is me I screwed up type post. It is a learning moment for me. 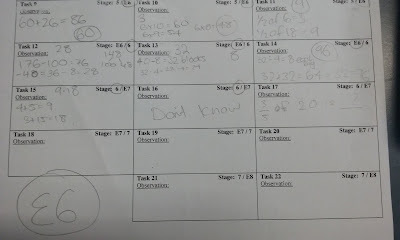 are my students ready and able to complete this activity? 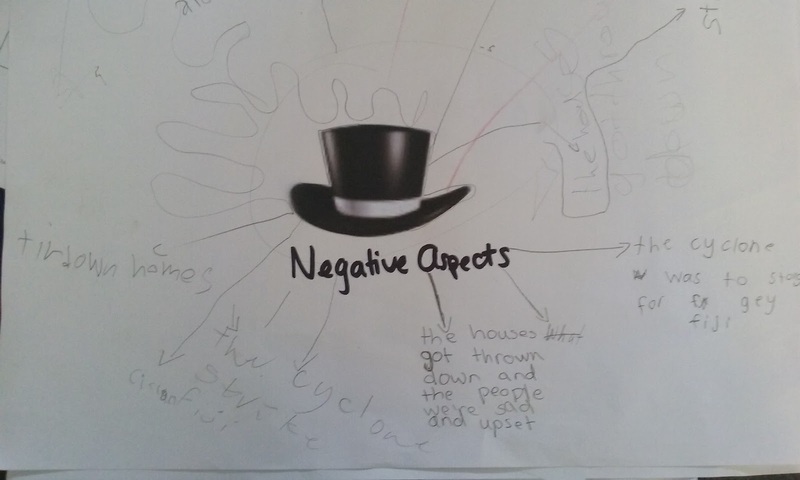 Have I given the students enough background knowledge to be able to use the thinking hats in this way? Do we have a good enough understanding of how to break apart an article to use them in this way? What else could I have used? A video? Update - during the day, I took ten minutes to talk to the students about this reflection of mine. Referring to our class treaty, (as per my theme of the week! ), I talked to the students about how Mrs Sharma and myself are a part of the room 6 team as well, which means we have to take risks, try our best and learn from our mistakes as well (ala the class treaty). The students and I sat in a circle and talked about how maybe I made the activity too hard, didn't explain it well enough etc., and discussed what I could do better next time. The students gave me good constructive feedback. 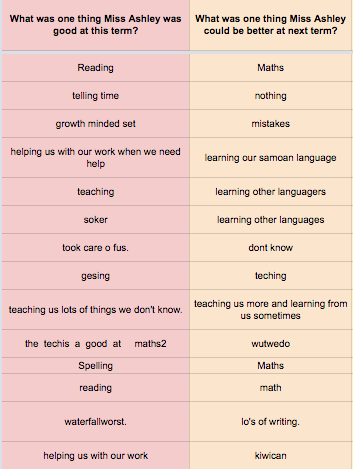 We then talked about with any activity or piece of learning, they can always give suggestions to the teachers for what to do better next time, just as we do for them. The students responded well to this idea, and didn't seem to realize before I said this that teachers aren't perfect and sometimes need help too. Talking with Archana later on in the day, she congratulated me in doing this - admitted a mistake, being open and listening to feedback, linking to our class treaty. 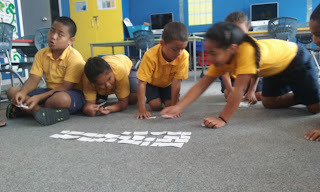 We discussed how it was an important learning time for the students, as it provided a real life example of how to admit mistakes, ask for help and take on feedback. First full day teaching by myself! As you may have figured out by now, because I am an MDTA student in a single-cell classroom, I am actually co-teaching with my mentor teacher Archana. We are both in the classroom, teaching, all the time. Archana is away for two days, so today was the first FULL day I taught by myself.. I managed the class well, was able to let go of the plan and come up with something different when needed, and most importantly for me, I followed through with my behaviour management strategies (well needed, but they worked!). I think I did much better than I did last week for those part days, as I was knew what to expect from the students (i.e. 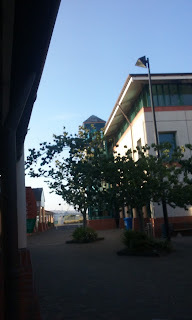 their misbehaviour, and which students in particular it would be) and had more faith in myself that I could manage anything that was thrown at me. I made the daily focus on team work, and threaded that throughout the day in everything I talked to the students about. It did work, and many of them learnt the word 'communication' today because of our extensive discussions. I'll try it again tomorrow and build upon it. 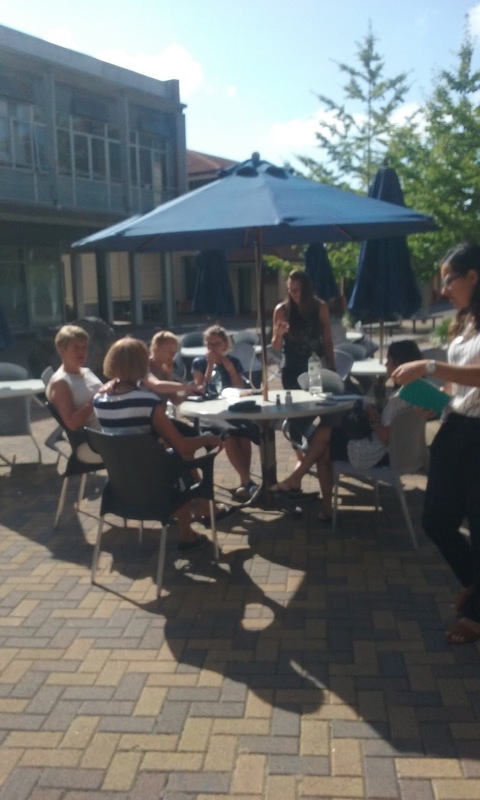 Today was the second day of Digital Immersion, where all the MDTA students spent the day at the University of Auckland Tamaki Campus up-skilling ourselves through digital learning and teaching. 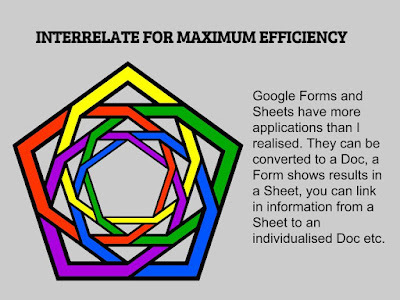 We focused on Sheets and Forms from the Google Apps series. As I had some prior experience using Microsoft Excel, I was very familiar with Google Sheets. 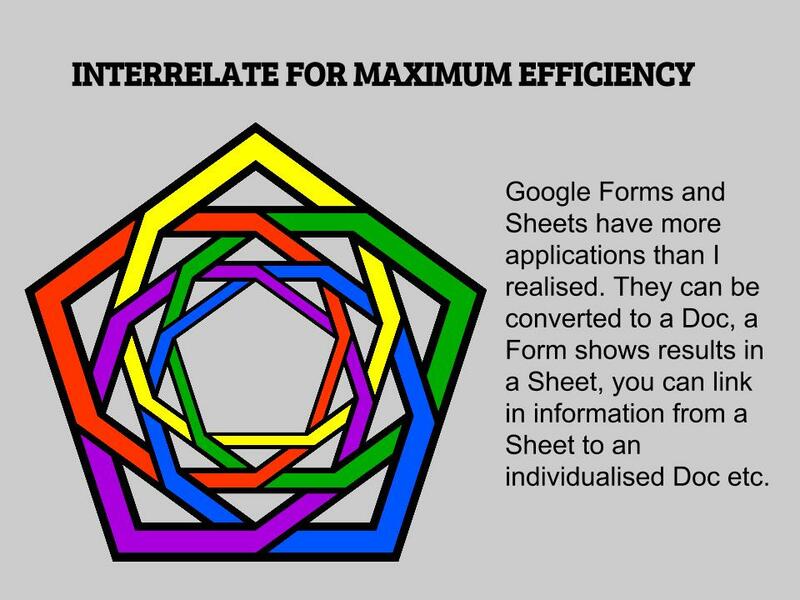 How to merge a doc/sheet/pdf/etc. We also played around the Google Forms, creating and sending each other forms to complete. Dorothy created one about Rugby which she then used to model how to automatically mark the answers - see here. As a MDTA Cohort, it was helpful to see realistic school-based uses for the Forms and Sheets. To finish off, we did another reflection. And here is the link to our collaborated MDTA reflections. I enjoyed revisiting old knowledge about Excel/Sheets that I learnt many moons ago, it was nice to experience for myself that 'aha' and 'ohhhhh yeah' moments that we search for in our students. On Tuesday afternoon, we had a syndicate meeting as per usual. This week we did a GLOSS test together to practice how to do it. To make a video so we could practice off, Archana interviewed a student while I recorded it and later edited it. It was really helpful to have a way to practice together so we could discuss what we had observed and recorded so confirm we were on the right track. 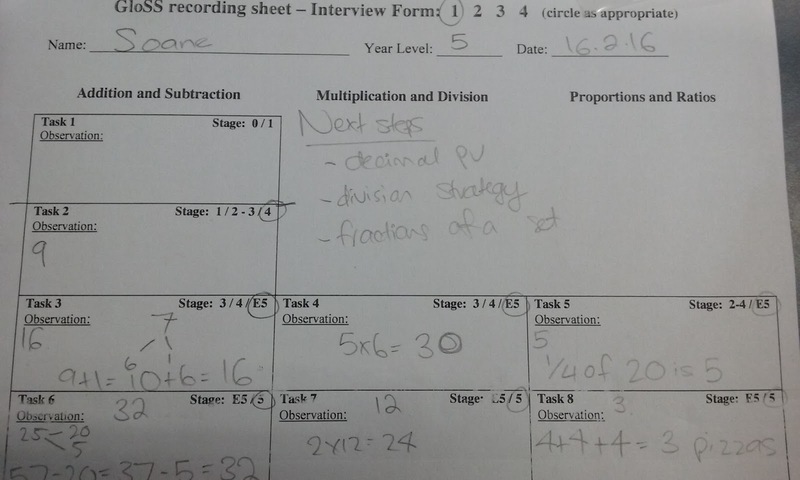 It was helpful to get the experienced teachers tip and tricks such as writing in the students next steps in the blank space, and limiting it to one for each maths facet (i.e. one next step for each column). 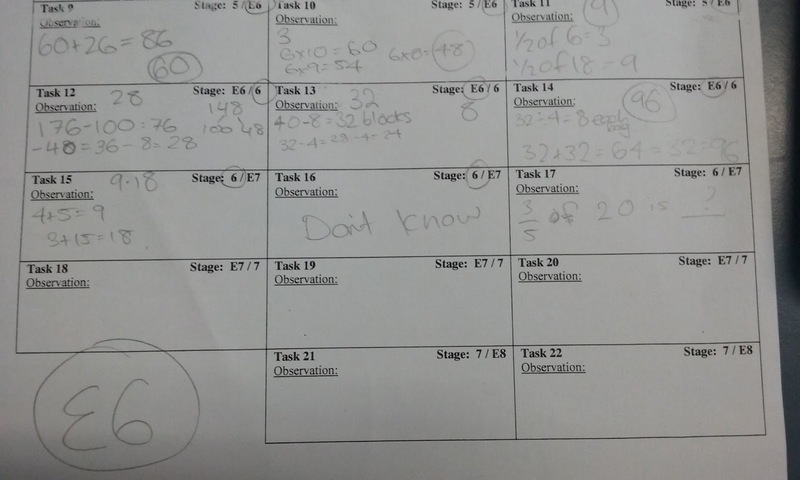 This affords you to give immediate feedback to students about how they did, and what they will focus on next. We were supposed to have our whole school day at the swimming pools, but it got rained out so we didn’t go. The kids didn’t know till they turned up with their togs on at 9am. It was raining and windy all day long, and so cold we had to close all the windows and the door. Because we were supposed to be at the pools all day, we had no planning for today. In the middle block, Archana wasn’t there. (For context, the first block I had been teaching by myself in the classroom when we have been team teaching for three weeks). I’d love to say it all went perfectly. I mean, it could have been worse. But that block tested me. I then made a deal with them that if they wrote something for me for 15 minutes, they could then play a game for the last 15 minutes before lunch. Great! 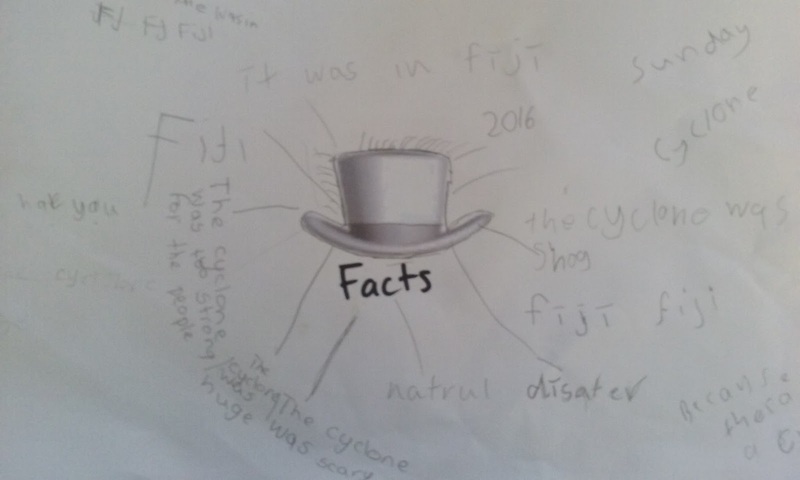 I ask them all the time ‘what did you learn today?’, so I wanted them to write about it so we could use it for the class blog. I had two students in particular, one who kinda always gives trouble (student A), and one who is typically an angel and quite the teachers pet (student B). 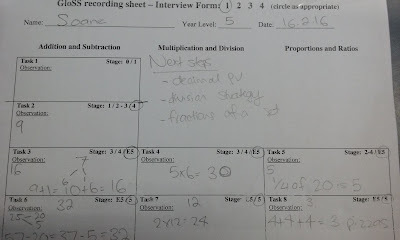 Student A, I put my attention on first as he does have special learning needs as well, and we talked about what was happening with him, at home, etc., and I asked him to take out his hearing aids. Wow! Literally the next minute he was off writing, giving me great ideas and sentences. Success! I gave her something else to do, a *special* task only she could do, and she went and focused and did it. Awesome. I’ve got this. Two troublesome kids and both on board. Ten minutes later, I called the class in and we played our game as promised. The lunch bell rang. The kids stayed inside…. again….. The students ate their lunch and talked, thats fine. I got the idea to watch a movie together, a way to keep them occupied and quiet throughout lunchtime in a positive fun way. But then I couldn’t connect my laptop to the projector, ugh, embarrassing for me, disappointing for the kids. 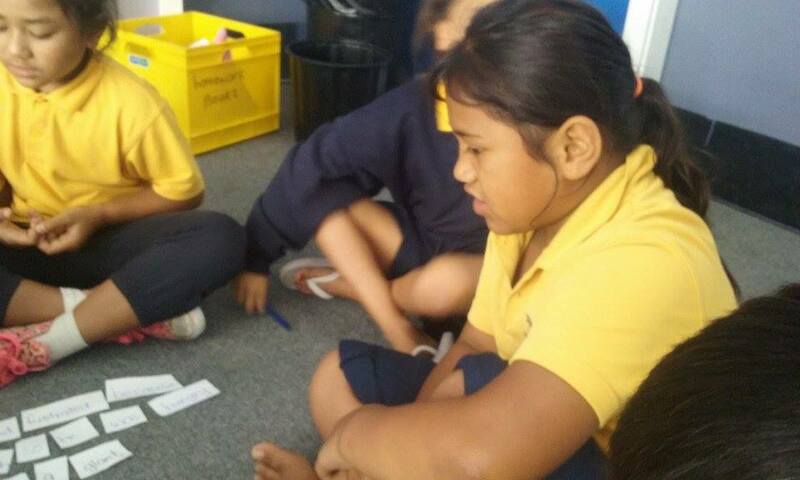 We started playing so maka lo together as a class - the students were listening, responsive etc. Student B was not. She sat in the middle of our circle staring at me. She put on a ‘classroom monitor’ tag, I asked her to take it off, she didn’t. Twice. I started to get impatient. Throughout the whole lunchtime, she talked back to me, ignored me, didn’t do what I asked her to etc. She really tested my patience. The class got a bit too rowdy and my patience was wearing a little too thin, so I asked them to either read, write or draw. They did, they went away quietly and did it. Except Student B. Student C made a paper plane, and I asked him (aloud, so the whole class could hear) to not throw it and put it in his bag, and he did so happily. Student B got up, made a paper plane and threw it across the classroom. I lost it a little. I went over to her, snatched the plane out of her hand, scrunched it up and put it in the bin. I addressed the class (not her in particular) and reminded them what I had just said, and said if anyone else throws planes they will loose them as well. Student B just wouldn’t stop. When the bell for lunch to finish came around, she wanted to do a special job that Archana had mentioned a couple days ago, and I asked her ‘do you think you deserve to go and do that after the way you have behaved?’. She straight up said no. She knew. As a BT in a co-teaching role, I haven’t experienced this level of purposeful defiance before. It was hard, yes, it really tested my patience, yes. I need to remember that I need to keep building up my teacher role with the students, and not get comfortable with the illusion that the students to see me as their teacher. I am not a student-teacher, but they might see me that way still. Having Archana not be in the class wasn’t scary, I was comfortable to be there and had confidence in myself as a teacher, but the students, well no, one student, obviously was not. I told Archana about this experience and we agreed it would be best if I kept on top of Student B, to reinforce my role as teacher. If Archana stepped in and said something to her, it would reinforce the students belief that she is above me, protecting me etc. I need to deal with this on my own, but it is helpful to know I have Archana there when I need her. Its D-day! 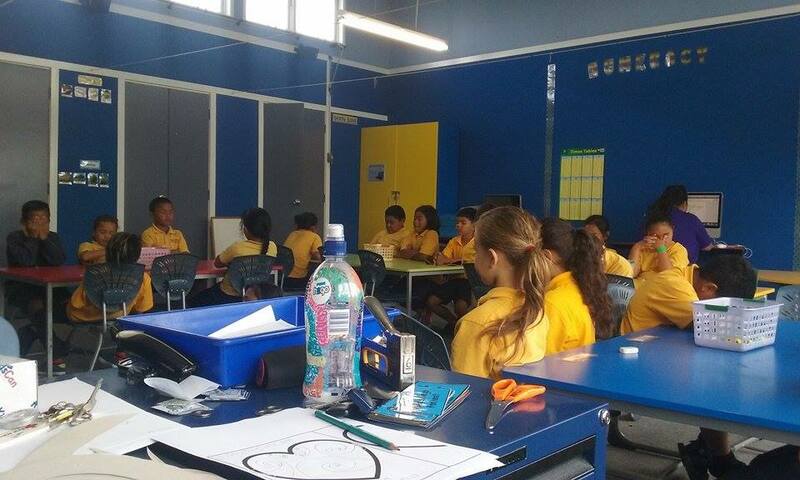 Archana and I had our observation from Anne Sinclair (from Manaiakalani) this morning, where she watched us for the whole middle block teaching our shared reading lesson. 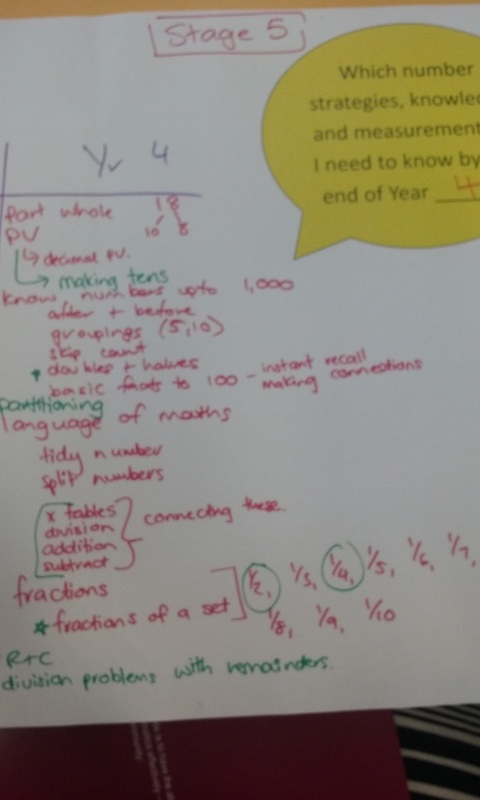 We continued from yesterday (see my blog post about that lesson here), and the students were engaged, responsive and could talk about their learning. "This was a truly shared lesson for both the teachers and the learners! The plan was designed with parts of the lesson divided up very evenly between both of you. The class is very well organised and managed, so you will be able attempt a lot of new things and really push the boundaries of ideas to accelerate the learners. 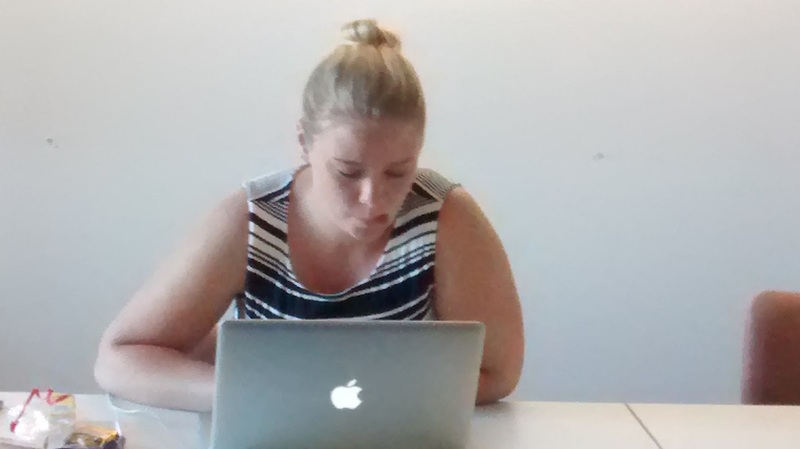 You seem very comfortable in the class Ashley and you have developed a good relationship with the learners. You have a very calm and assured manner with the learners and they feel safe and secure with you as the teacher. You obviously know the learners and can draw on their backgrounds and understandings, to provide feedback"
" You fitted seamlessly into the role of teacher when it was your turn to teach Ashley and you got the learners involved by getting them to turn to each other and check with a buddy on the WALT." 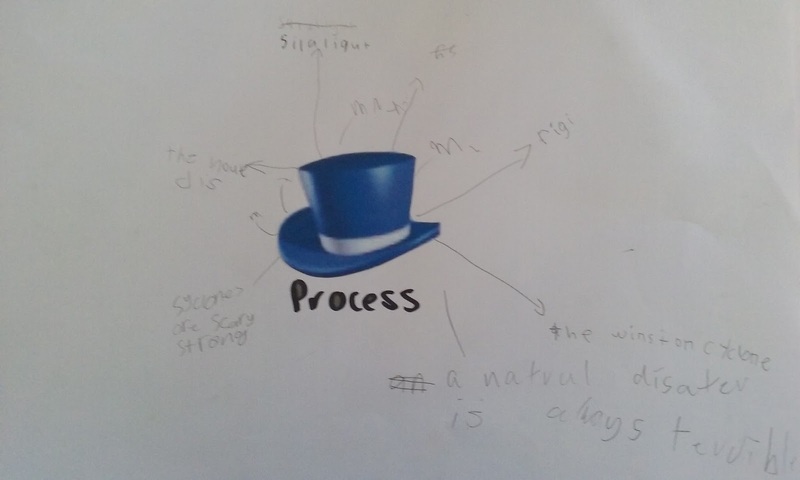 " The learners enjoyed being part of the process of creating the ‘story’. 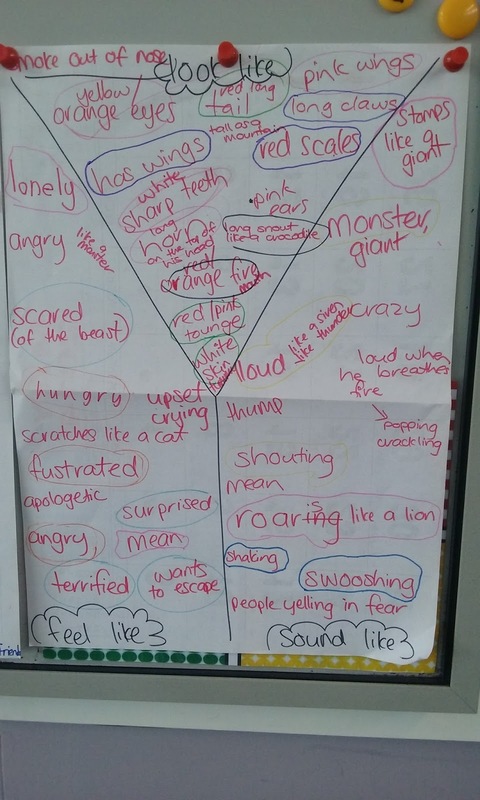 By referring back to the Y chart you were reinforcing the adjectives they used and cementing their knowledge and understanding." 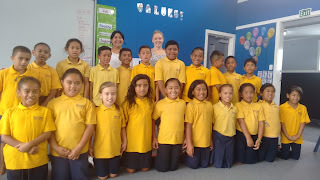 "The children in the class are a very cohesive group and seem genuinely wanting to learn. " " I am sure you and Archana will come up with some awesome learning experiences and opportunities this year to double the acceleration in this class. 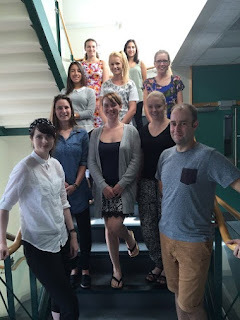 You work well together and have similar values and pedagogical beliefs. " " It is very affirming to see the relationship you and Archana have established and also seeing co-teaching done so easily. There is no Queen of the class, but 2 colleagues working together for the benefit of their learners." "Important to keep probing when you ask a question to give the learners time to process rather than asking another question. 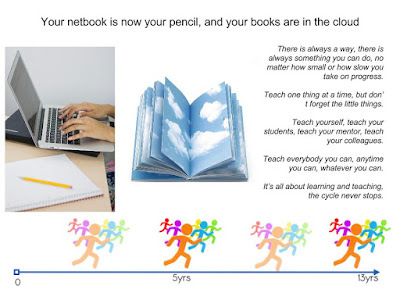 We often do not give learners ‘wait time’ to think and your learners needed that." "Remember to retain Miss Ashley’s persona and character, as we want a diversity of teachers, not clones. The idea of co-teachers is to use the skills and talents of both of you to enrich and enhance the learning for everyone (including yourselves)." - thinking point... it is great to have similar values etc, but what do I bring that is different/new/extra/diverse? So overall, a very positive observation, and it is good to have some things to think about as we are never perfect, and are always looking to improve ourselves and our teaching. Thank you Anne for your observation notes! All the best to my MDTA colleagues who will be observed over the next couple of weeks. Today my class has a lesson that ended in a different way than planned, in the best possible way. 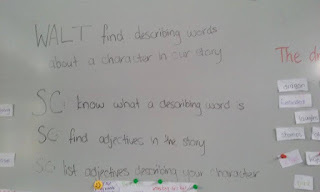 "WALT identify describing words for our characters. Ashley talks about adjectives. 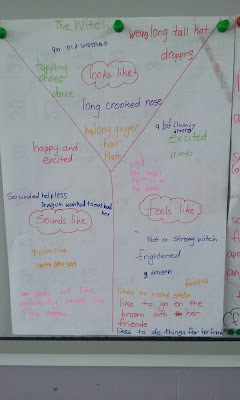 T brainstorms all describing words about the witch. 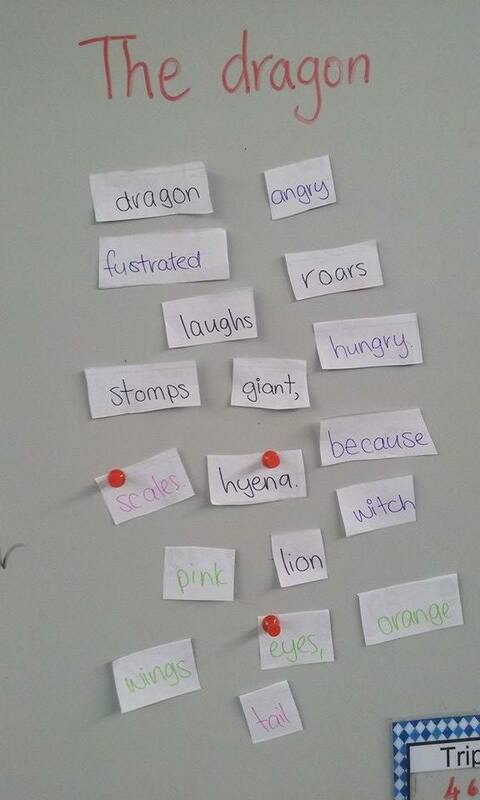 Use the Y chart to mind map adjectives. This done on modelling books. WALT on the modelling book and on the board. (15 minutes max). 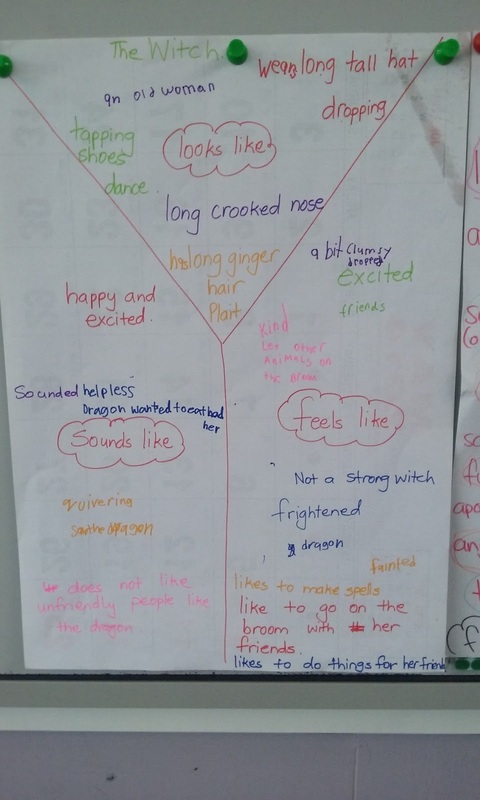 Archana works with 2 groups and Ashley works with the other two groups to brainstorm all describing words about the dragon(Ashley) and the witch (Archana). WALT on the modelling book and on the board. (15 minutes max)." When we came back together, I was just going to move on to the next part of the plan, which was to use the adjectives identified in a character description. However Archana asked one of the students from her group to come up to the board and read their sentences out. One by one, they did, and I saw how differnetly we had done the same activity. Where my group and I had just written adjectives and some similes (left hand image above), Archana had written linking statements (right hand image). You can see an example at the top right of her page, where she had 'wears long tall hat' and 'dropping', both written in red. 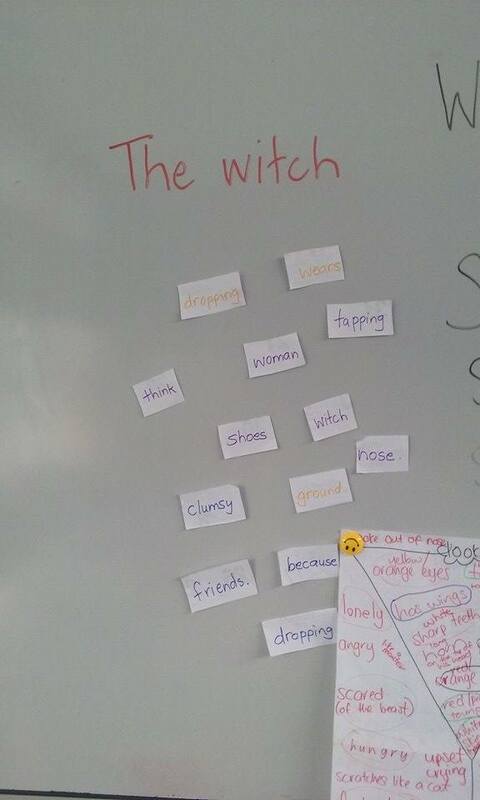 These two phrases, the students then linked into one sentence 'The witch wears a long tall hat which she keeps dropping' (or something along those lines). 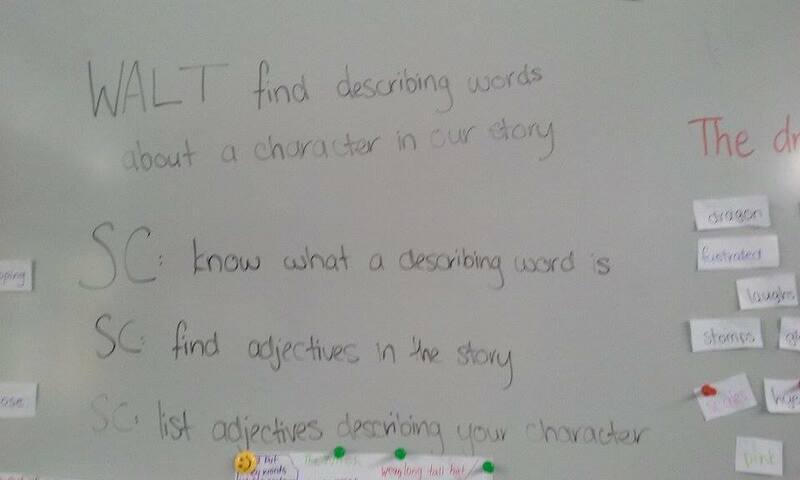 We had noticed last week that our students could not pull out keywords from a sentence, and now to reiterate the point, they struggled to use keywords to form a sentence. We changed the plan, and went back into our groups and linked some of our descriptions together to make sentences (hence the different coloured circles on the left hand image). 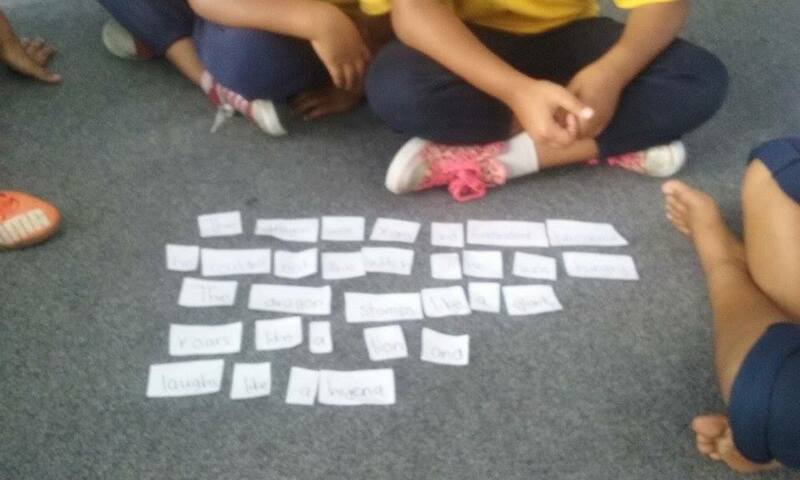 While my group was doing this, Archana's group began forming their sentences properly (as they had done it already). 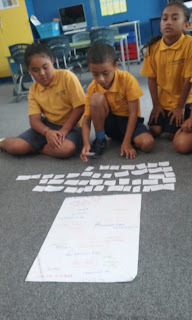 Archana got the students to form sentences, she wrote them out on strips of paper, cut them up word by word, and shared the pieces of paper out within the students. 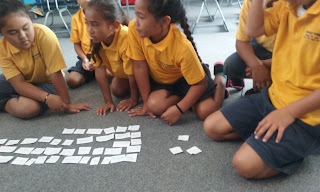 The students then had to re-form their sentences using all the key words and adjectives they had discussed. What I found awesome about this lesson was, not only did we focus on what they needed to know instead of just going with the plan (Note: It has been a learning curve for me to 'let go' of the plan), but also I got to see them develop other skills I otherwise couldn't have. During this activity, they were using their cooperation and collaboration, they were thinking critically, engaging cognitively and reinforcing their grammar and sentence structure knowledge by having to build the sentence together (read: argue about whether it should be 'a' or 'an'). It was especially awesome to see particular students who do not engage much normally, standing up for their decisions and debating about what made more sense and why, why the part about the 'plait' goes in the sentence with 'she has long ginger hair', etc. 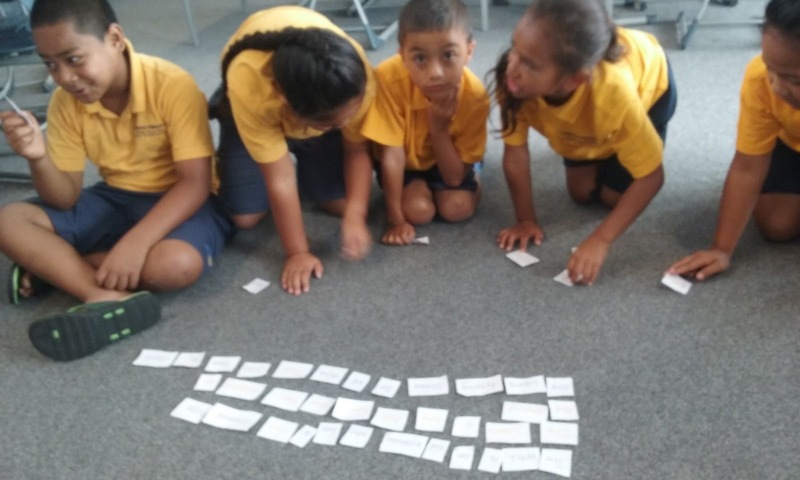 Representing the same information in multiple ways not only hooks in those students have different learning preferences, but gives them the opportunity to review the information more than one. This leads to deeper understandings and a bigger chance of the skill being transferable. Just try it. You never know what is going to hook in those outsider kids and get them interested. Watching the kids talk about their learning and critically think and reflect on their actions is awesome to see (and hear! ), but makes me think how much of that am I doing?? Today was the first day of the Digital Immersion part of the MDTA programme. 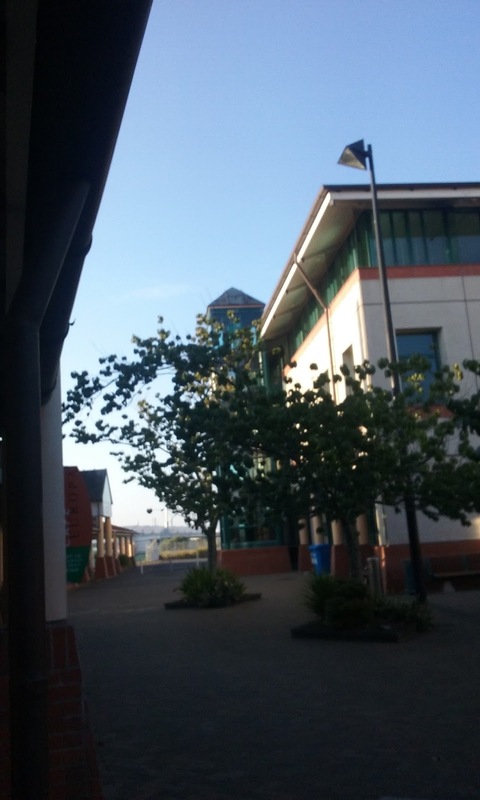 It is based at the University of Auckland Tamaki Campus in St Johns, Auckland. As I was at the MIT Campus in Otara for my BEd, its exciting to have another new place to learn, study and make home. We started our day with a breakfast at the university cafe, and then proceeded up to our class. We started with discussing how our classes/schools/mentors are going, and it was refreshing to know we all chose the same or similar keywords to describe our experiences. 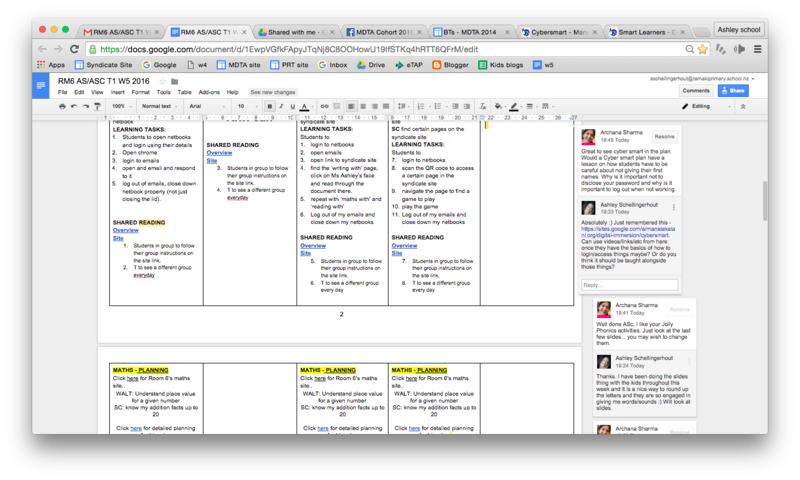 Throughout the day, we learnt new things about using Google Drive, and specifically Google Docs in order to prepare us for our digital classes this year. A lot of it we already knew as some-what tech savvy young adults, but you don't know what you don't know so its always good to review. It reflects one thing that has stuck with me all day. We are here to learn and become digital teaching experts, but we also need to teach others the things we learn along the way. This relates to the concept of Ako, which means to teach and learn together. Officially, I am a teacher. I have my children, my class. Its real! And what an awesome week it was as well, I had a lot of fun with my class and my mentor Archana. They are a bunch of really awesome kids, yes, some have very hard home lives (and very complicated home lives), but they are just amazing. I feel so lucky. We are setting up our routines, expectations, habits etc, explaining things as we go along. 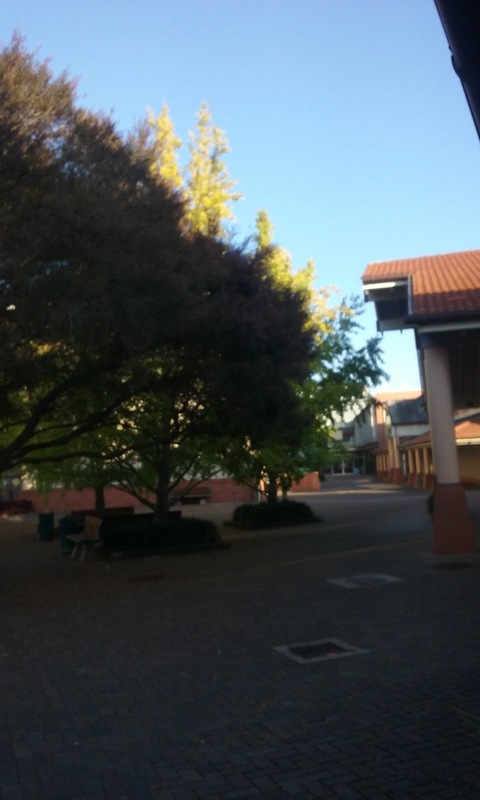 Below is a photo of my class meditating! And after the first few minutes of awkward giggling, they got really into it and are excited to meditate everyday after lunch. I hope this reflects our year together. Yes, maybe a bit awkward at times as we get used to each other, but awesome, relaxing, positive and good for the soul. This afternoon Archana and I reviewed this video in order to prepare for our syndicate meeting tomorrow. A good refresher of the theory I studied in my BEd around this topic. It was interesting that during my observations of Archana today was of the way she spoke to the children (read more here). Funny timing huh?